Taken at 6:16am, 27 minutes after sunrise. 1.6 second exposure, treated with ColorEfex Pro. I looked back and it had been 10 weeks since I last did an excursion for dawn (when I went to Great Falls, VA). What helped break that streak of sleeping in? I have my friends at the Calvert Photography Club to thank for that. We'd had a sunrise trip planned for several months. We coordinated with the county government to arrange for early and exclusive access to Flag Ponds Nature Park. The park normally doesn't open until 9am so it was a unique opportunity for our club to get access to an otherwise restricted area along the shoreline. Thanks to the park ranger who got up early and opened the gates, we had over 20 people down on the beach by 4:45am, almost a full hour before sunrise. This allowed everyone plenty of time to scour the beach and grounds for photo ops and prepare for the coming light. The starry night appeared mostly clear so I didn't have much hope for a dramatic sunrise. However, once we got to the beach and could see toward the horizon we could make out some thin cloud layers. I thought maybe, just maybe, we'll get a show. I chose to start along the curved shoreline, working in some long exposures with the driftwood and the first hints of light in the distance. The rest of the shots below are in chronological order. First shot of the morning, 4:55am, 54 minutes before sunrise. 65 second exposure. Driftwood and beach partially illuminated by the moon behind me and the first colors of dawn in the horizon. Venus glows toward the top. 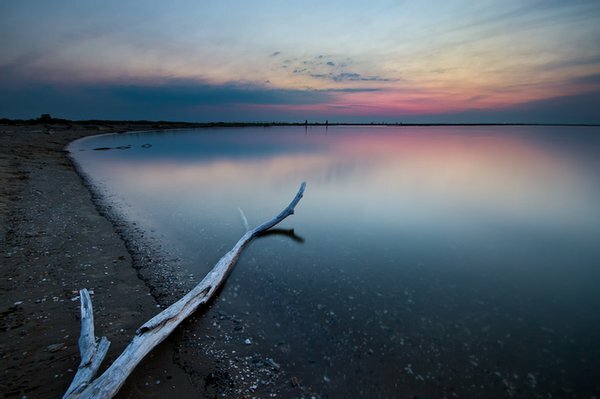 A tree limb, stripped bare and smooth by the elements, resting at the water's edge. Taken a little further down the beach at 5:20am, 29 minutes before sunrise. 12 second exposure. From my previous visits to Flag Ponds over the years I knew there was a pier toward the south end of the park. 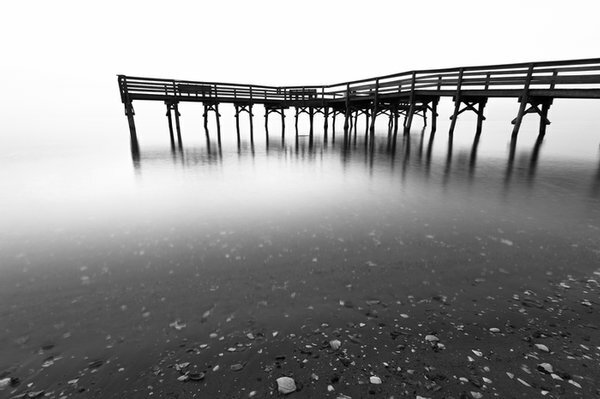 One of the shots I had in mind ahead of time was to capture the pier silhouetted and reflected in the water. 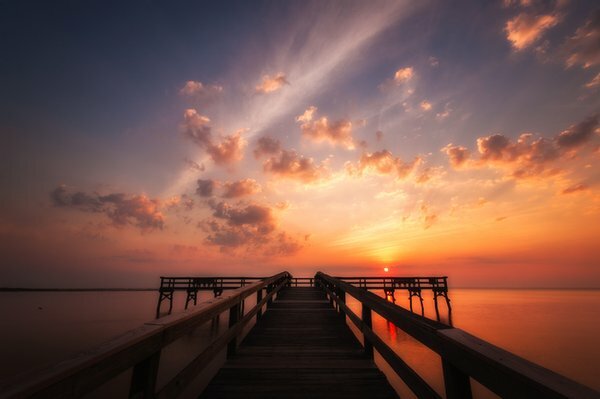 The stillness of the Chesapeake that morning convinced me to head that direction next. As you may notice from the rest of the photos (and the first two at the top), I never left that spot. It was just too beautiful to walk away from. First shot of the pier, over-exposed the sky to bring out the silhouette and the beach. Taken at 5:30am, 19 minutes before sunrise. 5 second exposure. By the time I took the shot above the light was bright enough that I couldn't get exposures very long. So it was time to break out the neutral density filters. I moved to the other side of the pier for the shot below. About a foot into the water was a chunk of wood, looked like a piece cut from a 12"x12". I decided to take the camera off the tripod and place it on the block of wood. I held it tight with my hand so there was no risk of it falling into the water. Securing it there allowed me to get the camera only a few inches above the water surface. I took the shot below from that spot. As it got closer to actual sunrise, the colors started to change but the horizon still looked very dense. After I took the shot above I was skeptical the sun would actually peak through. I could see some small clouds that I was hoping would pick up the light once the sun finally appeared but wasn't going to hold my breath. However, we were all happily surprised that the sun was able to burn through the moisture on the horizon and did show up right on schedule. Straight down the pier. I thought B&W worked better to bring out the textures and patterns in the wood. Taken at 5:55, technically 6 minutes after sunrise but we were just barely catching a glimpse of the sun. I walked back over to other side of the pier to catch the sun itself beneath the pier but the sky was too good to pass up. Those little clouds all started to pick up the colors and the scene in the sky was on par with the scene in the water. The only way to capture it all was a panorama. Almost 180° panorama to capture the entire scene together. Taken at 6:02am, 13 minutes after sunrise. 6 shots stitched together, each 3.2 second exposure. As I mentioned above, the scene was just to pretty to walk away from. I had planned to leave the pier at some point and wander back to the other edge of the beach to the north. But the patterns and colors created scenes at the pier I couldn't pass up. The photos below are all variations on the same theme, but I like them all and couldn't decide which ones to leave out. All in all, a very productive sunrise trip. Not a bad way to break a 10 week stretch of sleeping through dawn! Getting down low to capture the colors and patterns in the clouds. Taken at 6:10am, 21 minutes after sunrise. 10 second exposure. Trying to capture as much sky and color as possible. Taken at 6:28am, 39 minutes after sunrise. For a brief few moments, the beams were coming through the clouds clearly.